These universally chic pieces are all great for different reasons. The point is to start the process of a collection of basic pieces that you can count on to give you a great foundation to work with. Every style is unique, but what contributes to all fabulous cosets? A few common themes that create a standard stylish woman have begun to master . I have found that there are usually 7 characteristics to describe them every time. et’s discuss what they are so that you can apply it to your closet now. 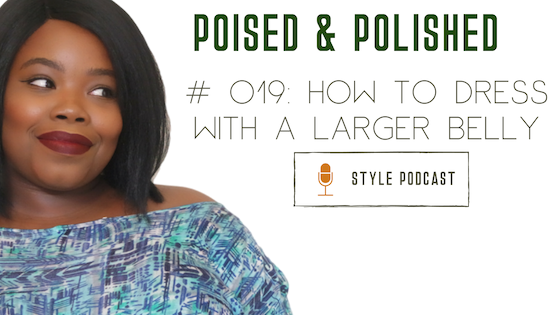 #025: What's in your glam bag? My glam bag has served me so many times in a pinch. I have a few versions that I keep in strategic places to ensure I’m in #stayready mode. Glam bags are a collection of items you can use to go from everyday to extraordinary in a pinch. Can’t go back across town to change, but you need to elevate your look? The Glam bag is coming to the rescue. I keep this glam bag in a pouch by itself that is in my purse. #024: Cute VS. Comfy: Is there a difference? These are falsehoods that make you think you are either not enough as is to be stylish and beautiful or you that you have to choose between comfort and fashion. YOU DON’T. Style is about freedom of all kinds-- expression, clothes, movement, etc.
? Are your decisions based on trends or your preferences? ?Are you settling for surface or substance? Settling at all? The style jar is a prompt I use with clients all the time to help them do more with the clothes they have while setting a standard for any new pieces. What is a style jar you ask? 2. Crumple each piece and put it in the bowl. When you are beginning your morning routine, pull a strip and create a look that reflects the word. Use it when you are feeling less inspired. What is the gift? It’s simple-- giving you back to yourself. Yup. You are the gift and a precious one at that. It’s time to start gifting yourself consistently so that you can have a strong overflow mindset. The overflow mindset is simple--- what’s in the cup is for you; what’s overflowing out of the cup is for everyone else. You only give and operate in the overflow. That way you can ensure that you’re taken care of and you aren’t in survival mode; you’re only thriving. So how do you give that gift and build your overflow? Taking care of you IS taking care of everyone else. Grab your hangers now and watch your clothing change. Sales are great, but only when you're not impulse buying or being taken advantage of. Yes this involves math, but not at scary levels. Let's get the know how to conquering sales for our closet's benefit. Sales are a good thing but shouldn’t be the only reason you buy clothing. Were you eyeing something like it? Are you spending more for the deal or actually saving? The dressing room can be a scary place, but it doesn’t have to be. This podcast we conquer that place together so you never have to worry about feeling defeated again. 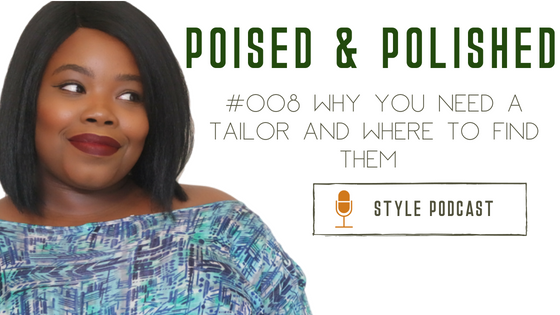 A tailor is a tool every stylista needs in her arsenal. Once you get the clothes you want, you will realize that they may need a little tweaking. This is because your clothing is mass produced and therefore not made with your particular body in mind. Most people think that a tailor cost lots of $$$. Nope! The average tailoring fix cost less than your daily Starbucks habit. Now you know that a tailor is affordable. So where do you find them ? Simple,short answer? : EVERYWHERE. The slightly longer answer? Keep listening. Find student aspiring to be costume designers and makers, well versed in sewing and construction. Many are trying to build portfolios and you could be of mutual benefit to each other. Some may charge; others may not. When I was in undergrad, I have had things hemmed and taken in for about $5 average. You never know until you ask around. Pro Tip: Look up the theatre chair and email/call them. Finding the costumer for a local company is hitting a gold mine. They are usually much too busy, but perhaps know of an aspiring costumer in town who wants to apprentice. The apprentice is also more than likely swamped, but eager. They will charge. Know that they will probably also have the costumer overseeing their work for quality control. I bring two pairs of pants: one paired needing to be hemmed, one needing a hem let out. After the job is done, I look to see if I like it. If it’s good, I found a new buddy. If not, to another tailor I go. If a tailor cannot hem pants well, I cannot trust their skill. It’s like a cook who can’t fry an egg—no Bueno.